Meet your Match Pro allows all members including Standard members rate one profile after another from one to five stars. 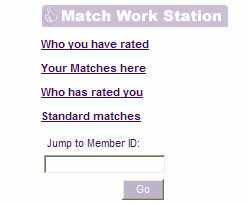 All members can also set their Match preferences and receive daily matches in our daily matchmaker programme. The ThaiLoveLines.com match Centre allows you to review, follow up and even create new matches. If you are an approved member with a photograph you can access the normal Meet your match Pro interface and rate newer members of the site. You can also now rate older members beginning at the back of the Members Gallery. Remember, you can only rate photographic profiles. You can see who a list of the latest members you have rated and follow up with chat, e-mail, skype and other communications tools. You can see who has rated your profile and rate them back using the star icon. when you see this icon on any list view, this is a member who has rated your profile four or five stars at sometime. By rating them back and selecting 4 or 5 stars you create a match where both parties are notified. You can see a list of matches made using Meet you Match Pro from the match workstation. You can view a list of matches that have made with your profile through our daily matchmaking programme. From this list you can also see the profiles here that have already rated you through Meet your match Pro where the star icon is displayed. You can call up any visible profile and rate in for the purposes of Meet your match at the bottom of the profile. The Match Centre allows you to identify profiles and other members that are of interest to you and follow up on that interest through the site's direct communication tools. This is a Standard membership feature on ThaiLoveLines.com although we recommend Premium Membership to make your love search as effective as it can be. (Above) The Match Centre is a work station where you can develop online matches and follow up on match contacts through other communications tools. (Below) You can use Meet your Match Pro to rate newer members and older members in two seperate views allowing you to cover all photographic profiles online. Where you see the star icon on a profile, you know this is a member who has rated your profile 4 or 5 stars. You can rate them back and create a match alert.